This weekend I had the privilege of being presented with a Doctor of Ministry from Covenant Theological Seminary in St. Louis. 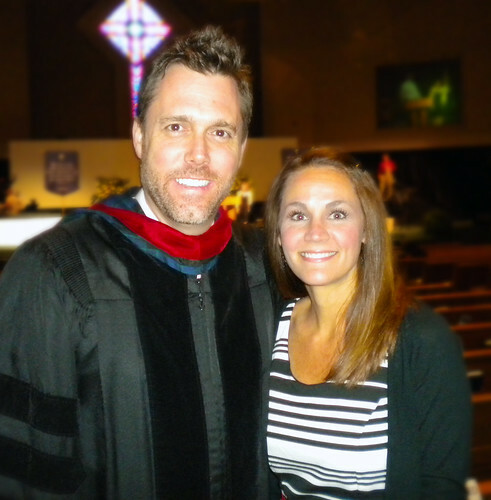 The graduation itself was a special time (even more so with my wife being able to accompany me). From the playing of bagpipes in the opening to the benediction in song by one of the professors, it was a service full to the brim of emotion and significance. While ceremonious, the commencement had a very warm, personal feel. Laughing, embracing, and shouting for joy were evidenced all throughout the graduation. The doctoral graduates formed the final procession of those receiving their degrees. It was special not only to hear my name but the title of my dissertation announced to the crowd as well. Wearing my three-stripes doctoral robe, I was subsequently “hooded” with my doctoral regalia marked by Covenant’s blue and green tartan which hearkens back to its Scottish Presbyterian forebears. I received my diploma from the school’s president then sat down, grateful for it all. One of the most moving moments for me was receiving a standing ovation, led by the Master of Divinity graduates, for all the doctoral grads. They leapt to their feet almost immediately after applause started to break out for my fellow doctors. Frankly, it was hard to keep my composure in the face of such sweet tokens of appreciation. It was deeply moving and something I likely will never forget. This has concluded a wonderful journey that began in 2010. After graduating college I thought I would get a doctorate before I was 30. However, as I moved toward my three decades of life, it never felt like the right time. Now that I’m on the backside of receiving my doctorate I am convinced I began the doctoral program when I needed to. It has been a wonderful time of learning, friendship, and pushing myself both personally and ministerially. I am profoundly grateful for the men and women who comprise CTS and pray the Lord blesses them richly! Congrats, Yancey! We are so excited for you and proud of you as you celebrate this tremendous accomplishment!! Awesome job man! Glad to see it was such a rich time! Yo Yancy, Now I can say with highest esteem and joviality, WHAT’S UP DOC?